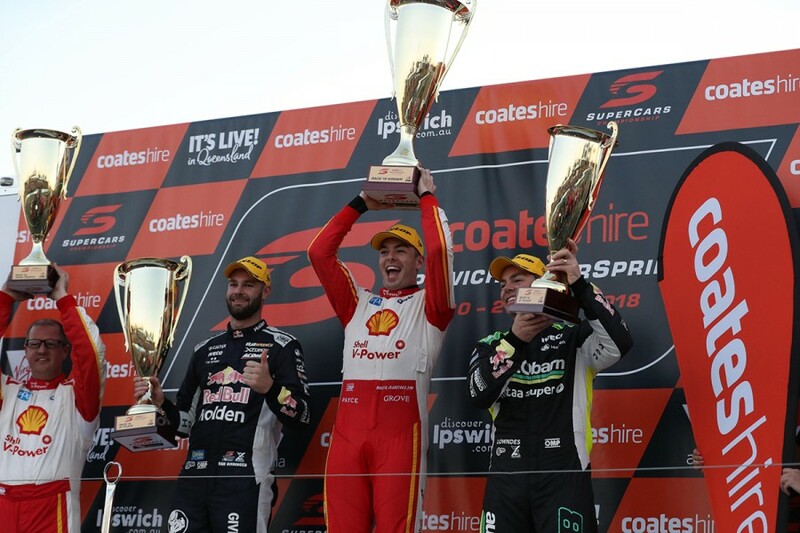 Scott McLaughlin has extended his Virgin Australia Supercars Championship lead with a comfortable victory in the opening leg of the Coates Hire Ipswich SuperSprint. The Shell V-Power Racing driver controlled the 39-lap race from start to finish, taking his seventh win of the campaign. 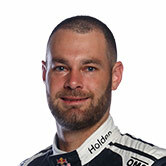 His closest title challenger Shane van Gisbergen finished second, with Craig Lowndes third just ahead of Jamie Whincup. Van Gisbergen and Lowndes came from eighth and 10th on the grid - the former minimising the points loss to McLaughlin. McLaughlin kept the lead off the line, with team-mate Fabian Coulthard holding Rick Kelly's Nissan at bay to slot into second. The big mover on the first lap was van Gisbergen from eighth, getting up to fourth at the start and then passing Kelly for third at Turn 4. At the front, McLaughlin eased away to lead by 1.5 seconds by the time he pitted on lap 13, as van Gisbergen passed Coulthard. 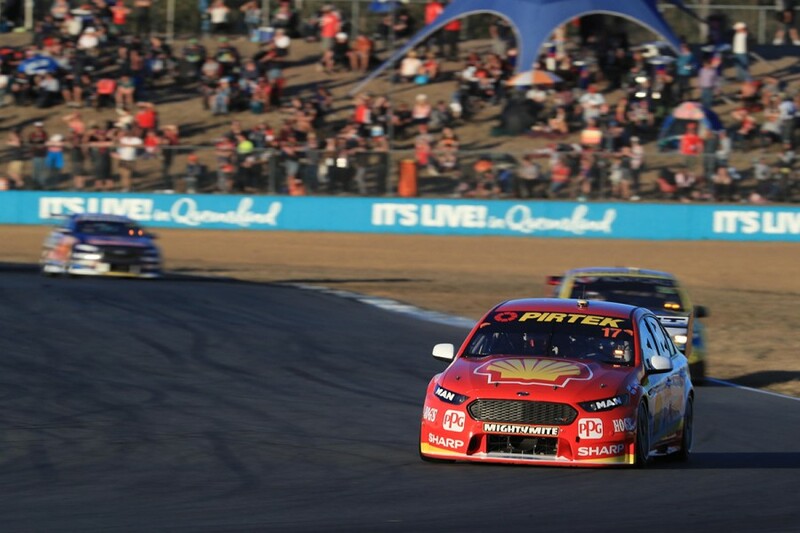 McLaughlin rejoined with the undercutting Chaz Mostert right behind, but maintained the lead. He then edged away as Mostert's older tyres dropped-off in the second half of the race. Van Gisbergen became his closest challenger, but McLaughlin was 4.3s clear with 10 laps to go and crossed the line with that same margin. 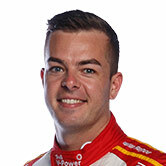 The victory is the 23rd of McLaughlin's Supercars career, and his points lead over van Gisbergen grows to 143. “That was awesome, thanks to everyone here. There’s massive support, obviously #17 in Queensland is a big thing and it’s great to be a part of it,” he said. “There was crazy stuff going on (during the opening lap) and my tyres took ages to come up to temperature. 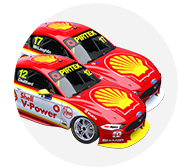 DJR Team Penske and Triple Eight's five drivers filled the top five places in a show of strength from the heavyweight teams on their home circuit. Mostert looked a chance to upset that when he qualified second, but was handed a three-place grid penalty for impeding van Gisbergen. Having fallen to sixth from fifth on the opening lap, he lost three more spots on lap three after an exchange with Whincup at Turn 6. A touch from the Red Bull Holden down the inside unsettled Mostert's Falcon, which then ran out of road on the exit as they ran side-by-side. Tickford deployed an undercut strategy for Mostert, with a lap-eight pitstop for left-side tyres paired with clear air and good pace. It initially paid dividends, with Mostert just behind McLaughlin when the effective race leader emerged from his stop. As tyre wear kicked in, van Gisbergen and Lowndes passed Mostert in one swoop on lap 24, with Coulthard making his own move at Turn 4 on the same lap. Van Gisbergen eased away from Lowndes to take second, while Lowndes and Coulthard disputed third as Whincup closed in. “I just dropped the clutch and away it went. It was a really cool first lap, lots of room given, great racing,” van Gisbergen reflected. Kelly and Whincup were the last of the lead group to pit, doing so together on lap 21, with Whincup getting out in front. From the foot of the top 10, Whincup carved his way back up the order, passing Coulthard for fourth at the start of the final lap. Lowndes held on for third by the barest of margins over Whincup, with Coulthard rounding out the sweep for Supercars' powerhouse outfits. “I was running out of rear tyres, but thankfully we just had enough,” explained Lowndes. “Jamie got the side slipstream and it’s like hitting a brick wall. I was like ‘come on finish line’, trying to will it on." Mostert was the best of the rest in sixth, finishing just ahead of David Reynolds, James Courtney and the top Nissan of Michael Caruso. Whincup now moves back into third in the standings ahead of Erebus driver Reynolds. Nick Percat rounded out the top 10, from Garth Tander, lead rookie Richie Stanaway and Kelly, whose slower stop proved costly to finish 13th. 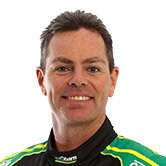 Todd Hazelwood was the only driver to strike serious trouble, losing five laps in pitlane with a starter-motor problem.